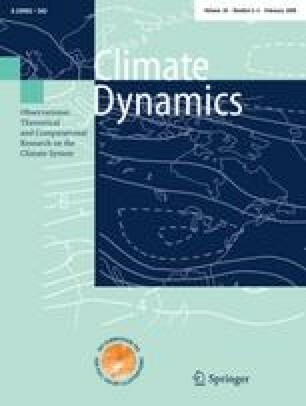 A linear analysis is applied to a multi-thousand member “perturbed physics" GCM ensemble to identify the dominant physical processes responsible for variation in climate sensitivity across the ensemble. Model simulations are provided by the distributed computing project, climate prediction.net . A principal component analysis of model radiative response reveals two dominant independent feedback processes, each largely controlled by a single parameter change. The leading EOF was well correlated with the value of the entrainment coefficient—a parameter in the model’s atmospheric convection scheme. Reducing this parameter increases high vertical level moisture causing an enhanced clear sky greenhouse effect both in the control simulation and in the response to greenhouse gas forcing. This effect is compensated by an increase in reflected solar radiation from low level cloud upon warming. A set of ‘secondary’ cloud formation parameters partly modulate the degree of shortwave compensation from low cloud formation. The second EOF was correlated with the scaling of ice fall speed in clouds which affects the extent of cloud cover in the control simulation. The most prominent feature in the EOF was an increase in longwave cloud forcing. The two leading EOFs account for 70% of the ensemble variance in λ—the global feedback parameter. Linear predictors of feedback strength from model climatology are applied to observational datasets to estimate real world values of the overall climate feedback parameter. The predictors are found using correlations across the ensemble. Differences between predictions are largely due to the differences in observational estimates for top of atmosphere shortwave fluxes. Our validation does not rule out all the strong tropical convective feedbacks leading to a large climate sensitivity.